There are two common dangers that counselors face with the themes and solutions they emphasize. On the one hand there is a temptation to overemphasize some contributing factors. We can suggest that causation, for example, is easily explained by one factor instead of recognizing the complexity of people and situations. We can also deemphasize other aspects, ignoring the significance of on key tool, for example, in treatment. Gregory Jantz has written an insightful and useful book about eating disorders, and yet he succumbs to both of these dangers. 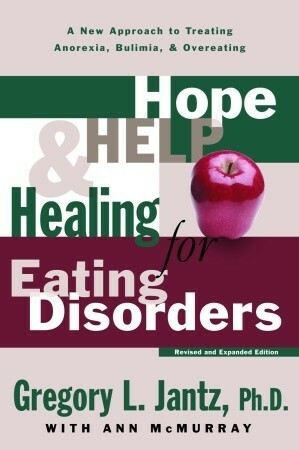 Hope, Help, & Healing for Eating Disorders both overemphasizes the role of parental failure in developing an eating disorder, and deemphasizes the person of Christ in the treatment of eating disorders. Gregory Jantz is widely recognized as an expert in the field of eating disorders. He is a certified eating disorder specialist, and his book reveals the wealth of experience he has had in helping others. This volume will give readers, whether those suffering and those seeking to be helpful, a great introduction to ED. Readers will learn about the definitions of the common types, the frequent symptoms that accompany long-term habits, and the helpful tools and strategies that can give aid to someone seeking to overcome. Jantz’s approach focuses on what he calls a “whole-person” approach to therapy. “This approach,” he explains, “incorporates all the different aspects of your being: emotional, intellectual, physical, relational, and spiritual” (2). He emphasizes the need for balance and interplay between these various aspects of our being. The book does this through giving information in the chapters, demonstrating the significant factors at play between our body, mind, and spirit, for example, and then also giving readers active responses in the “Food for Thought” and “Right Direction” section at the end of each chapter. Here readers are giving instructions on how to respond to and apply the principles of each chapter. I found a great deal in the book that is helpful and insightful. As a Biblical counselor I want fully appreciate Jantz’s holistic approach. Far too much counseling, both Christian and secular, relate to people as purely cognitive machines. Any approach that takes the whole-person into account is worthy of acknowledgment. Even Biblical counselors can get sucked into doing nothing more than cognitive behavioral therapy if we aren’t careful. Furthermore, I appreciated his detailing of the physiological impact of an eating disorder. He helps readers to navigate both the long-term damage a ED can cause, and the physiological needs for change (resetting digestion, nutritional rehabilitation, the significance of rest, etc.). As a non-medical person these are vital details counselors must know. Furthermore, Jantz acknowledges the complexity of factors that make overcoming an eating disorder difficult. He acknowledges the interplay of anger, fear, shame, and guilt. He acknowledges the influence of past hurt, the biological hindrances, and the pride that can accompany the illusion of control. His experience in working directly with hundreds of sufferers allows him to speak with great personal insight on the common symptoms, problems, and deeper issues surrounding an ED. Biblical Counselors would do wise to hear from someone like Jantz. Yet, there are some major concerns with the book. A primary concern is the lack of Scriptural interaction. The book has some very wonderful usages of Scripture at times, connecting people with deeper spiritual truths to help the wrestle with their ED from that perspective. Yet, for the most part he misses many great opportunities to offer Biblical motivation. For example, when encourages readers to move towards forgiveness of those who have wronged them in the past, he acknowledges that some individuals will never acknowledge the hurt they’ve caused. His response to such a heartbreaking reality: You must move on (172). There’s no indication as to “how,” and no exploration of the gospel freedom that permits us to deal with broken relationships. Even his chapter on forgiveness makes no mention of the death of Christ. The same criticism can be made of his chapter on fear, guilt, and shame. The gospel is nearly entirely absent from a book that professes to help readers with their spiritual growth a well as their psychological! Even his chapter on approach God as the “perfect Father” invites readers to do so completely apart from the person and work of Jesus Christ! That is a major oversight and a major shortcoming. When my motivation is not connected to the gospel it will always be unbalanced. Furthermore, and with equal concern, Jantz makes parental failure the dominant cause of a person’s development of an eating disorder. This thread begins in chapter three and is woven through much of the rest of the book. While no one can reasonably deny the influence of our upbringing on us, our parents do not ultimately determine who we become. At one point in the book Jantz acknowledges the individual responsibility we each have for our unhealthy eating habits (67). When talking about a the influence of family, however, he seems to imply that a person’s eating disorder is someone else’s fault, namely their parents. There are some good insights in his discussion of the parental relationship and the development of eating disorders, but when that becomes the sole focus (like in chapters 11, 12, and 13) then it reduces problems to one single causation. This is a major flaw in the work. It will ring true for some, but for many others it will become unhelpful. Furthermore, the inability to categorize the past theologically will hamper the approach that Jantz takes. His counsel in these chapters on past family failures, dredges up the past and invites people simply to put responsibility at the feet of others and “move on.” It doesn’t give us a theological and Biblical way for framing the past and for framing the future. The counsel offered in these chapters boarders more on “common sense” than genuine therapeutic insight. Many readers will find these chapters simplistic and reductionist. Overall Hope, Help, & Healing for Eating Disorders doesn’t offer as much of a whole-person approach as it suggests. It overemphasizes the parental role in the relational aspect, and it under-emphasizes the role of Jesus Christ in the spiritual. These are major flaws in a Christian therapeutic system. There are many great insights in the book and for that reason Biblical Counselors should read and consult it, but I do not recommend following Jantz’s model in total. A more Biblical model will need to make up for the weaknesses described.